Pentre Heylyn in the county of Montgomery was the seat of the Heylyn’s. This name in the British language signifies a Cup-Bearer; and they were legendary Cup Bearers to the princes of Powis-Land, from whom they descended in a direct line by Grono ap Heylyn, who, in the reign of king Edward I. was commissioned by Lewellyn, the last prince of Wales, to treat with the commissioners of the said king about a final peace. This family possessed their seat at Pentre Heylyn until A. D. 1637, at which time Rowland Heylin, alderman of London, died without issue male, and so the seat was transferred into the family of counsellor Mieoals, who married Rowland Heylin’s daughter, who was an heiress, and whose grand-daughter, Mary Niccols of Highgate in the county of Middlesex. married col. William Congreve, of the foot-guards, grandfather to the late major-general William Oongreve, of the royal artillery, who had in his possession the portraits of Rowland Heylin and his wife, counsellor Niccols and his wife, (their son and daughter), Niccols, esq. of Highgate (who was an eminent Turkey merchant) and his wife, and Mary Niccols their daughter, who married col. W.ll.am Congreve; also their descendants; in all, seven generations. | make his peace with the king, declared that the error, in one of the exceptionable passages, was entirely the printer’s, who had put is instead of was; and that when he himself mentioned the precedency of France before England, he did not speak of England as it then stood augmented by Scotland, and besides he took what he did say from Camden’s Remains. James being satisfied with this apology, Heylin took care that the whole clause, which gave so much disgust, should be left out in all future impressions. The work was afterwards successively enlarged, till it became a great folio, and has since been often reprinted in that size. In 1625 he went over to France, where he continued about six weeks, and took down in writing an account of his journey; the original manuscript of which he gave to his friend lord Danvers, but kept a copy for himself, which was published about thirty years after. Jn April 1627, he answered, pro forma, upon these two questions: 1. <* An ecclesia unquam fuerit invisibles“” Whether the church was ever invisible?“2.” An ecclesia possit errare“”Whether the church can err“both which determining in the affirmative, a great clamour was raised against him as a papist, or at least a favourer of popery. Wood says, that Prideaux, the divinity-professor,” fell foul upon him for it, calling him Bellarminian, Pontifician, and I know not what." Heylin was not easy under the charge of being popishly affected; for which reason, to clear himself from that imputation, he took an opportunity, in preaching before the king on John iv. 20, of declaring vehemently against some of the errors and corruptions of the Romish church. In 1628, lord Danvers, then earl of Danby, recommended him to Laud, then bishop of Bath and Wells; by whose interest also, in 1629, he was made one of the chaplains in ordinary to his majesty. 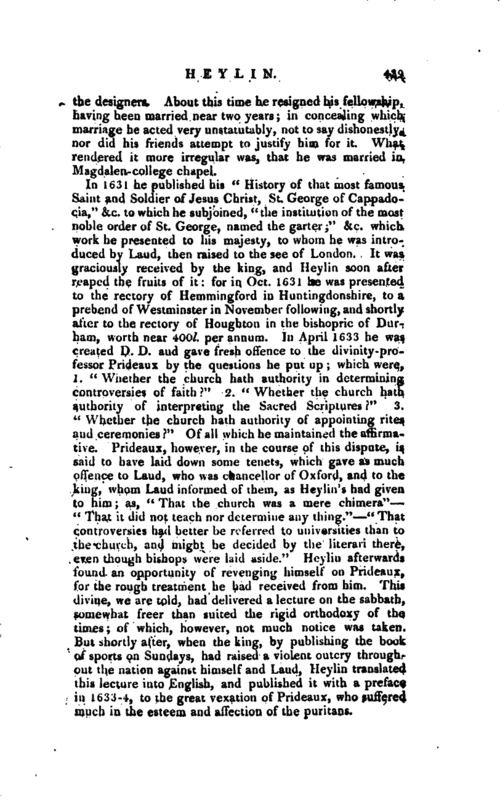 On Act-Sunday 1630, he preached before the university of Oxford at St. Mary’s on Matth. xiii. 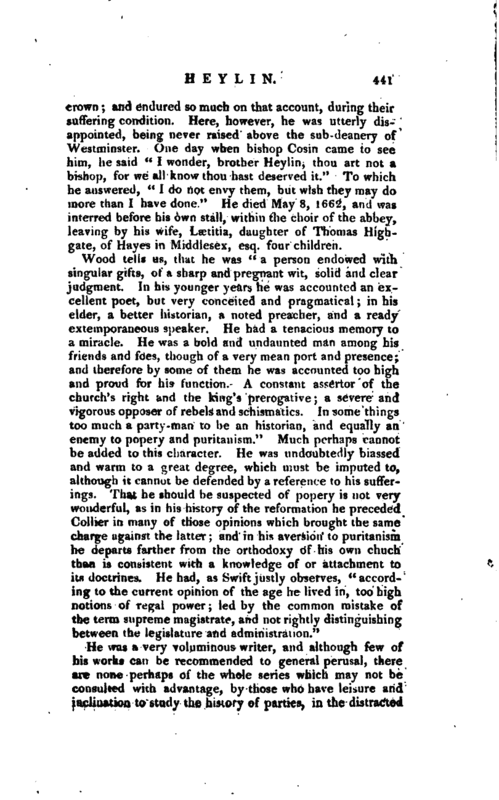 25, whence he took occasion to deliver his sentiments very freely in regard to an affair which at first sight had a specious appearance of promoting the honour and emolument of the ecclesiastical state, but was in reality a most iniquitous scheme, injurious to the laity, and of no service where it was pretended to avail. This was a feoffment, that some designing persons had obtained, for the buying in of impropriations; but Heylin, seeing through the disguise, exposed very clearly the knavery of | the designers. About this time he resigned his fellowship, having been married near two years; in concealing which marriage he acted very unstatutably, not to say dishonestly, nor did his friends attempt to justify him for it. What rendered it more irregular was, that he was married in Magdalen-college chapel. In 1631 he published his “History of that most famous Saint and Soldier of Jesus Christ, St. George of Cappadocia,” &c. to which he subjoined, “the institution of the most noble order of St. George, named the garter” &c. which work he presented to his majesty, to whom he was introduced by Laud, then raised to the see of London. It was graciously received by the king, and Heylin soon after reaped the fruits of it: for in Oct. 1631 he was presented to the rectory of Hemmingford in Huntingdonshire, to a prebend of Westminster in November following, and shortly after to the rectory of Houghton in the bishopric of Durham, worth near 400l. per annum. In April 1633 he was created D. D. and gave fresh offence to the divinity-professor Prideaux by the questions he put up; which were, 1. “Whether the church hath authority in determining controversies of faith” 2. “Whether the church hath authority of interpreting the Sacred Scriptures” 3. “Whether the church hath authority of appointing rites and ceremonies” Of all which he maintained the affirmative. 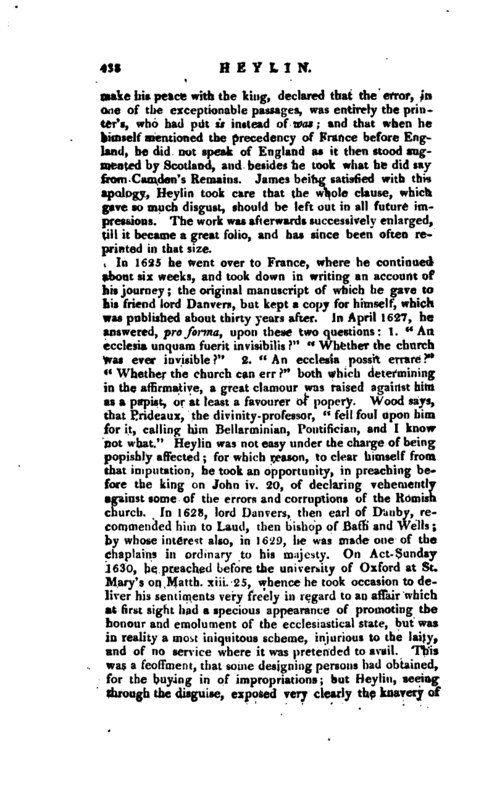 Prideaux, however, in the course of this dispute, is said to have laid down some tenets, which gave as much offence to Laud, who was chancellor of Oxford, and to the king, whom Laud informed of them, as Heylin’s had given to him as, “That the church was a mere chimera” “That it did not teach nor determine any thing.” “That controversies had better be referred to universities than to the church, and might be decided by the literari there, even though bishops were laid aside.” Heylin afterwards found an opportunity of revenging himself on Prideaux, for the rough treatment he had received from him. This divine, we are told, had delivered a lecture on the sabbath, somewhat freer than suited the rigid orthodoxy of the times; of which, however, not much notice was taken. But shortly after, when the king, by publishing the book of sports on Sundays, had raised a violent outcry throughout the nation against himself and Laud, Heyliu translated this lecture into English, and published it with a preface in 1633-4, to the great vexation of Prideaux, who suffered much in the esteem and affetion of the puritans. | Williams, bishop of Lincoln and clean of Westminster, having incurred the king’s and Laud’s displeasure, and being suspended and imprisoned, Heylin was made treasurer of the church of Westminster in 1637; and was also presented by the prebendaries, his brethren, to the rectory of Islip near Oxford. This he exchanged in 1638, for that of South-Warnborough in Hampshire; and the same year was made one of the justices of the peace for that county. 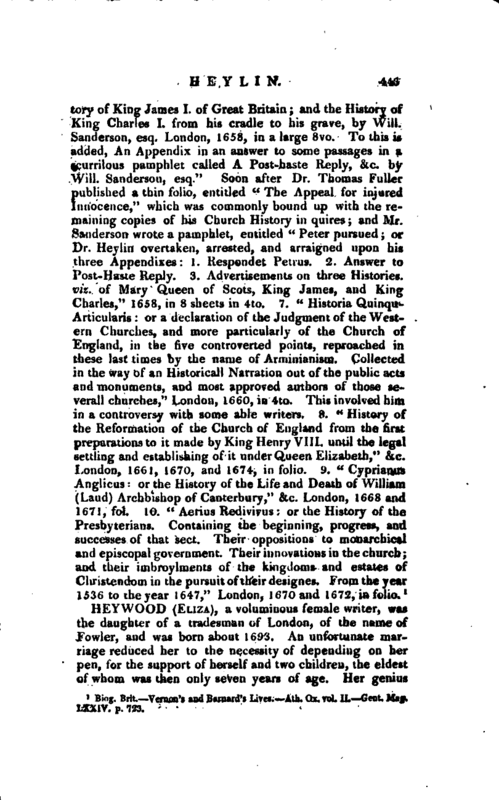 In 1639 he was employed by Laud to translate the Scotch liturgy into Latin; and was chosen by the college of Westminster their clerk, to represent them in convocation. But a cloud was gathering, which threatened to overwhelm all who, like him, had distinguished themselves as champions for royal or ecclesiastical prerogative. To shelter himself therefore from the impending storm, he withdrew from the metropolis, where he had long basked in the sun-shine of a court, to his parsonage; but not thinking himself secure there, retreated soon after to Oxford, then garrisoned by the king, and the seat of his residence. On this the parliament voted him a delinquent, and dispatched an order to their committee at Portsmouth, to sequester his whole estate, and seize upon his goods. In consequence of this severe decree, he was deprived of his most curious and valuable library, which was carried with his household furniture to that town. 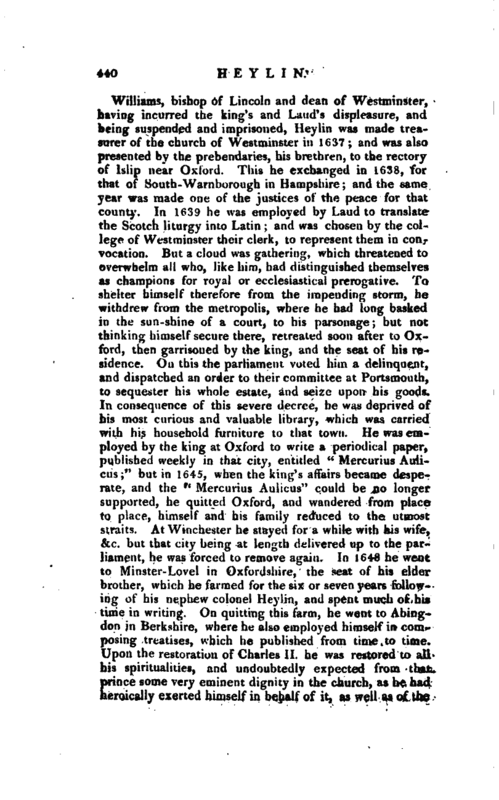 He was employed by the king at Oxford to write a periodical paper, published weekly in that city, entitled “Mercurius Aulicus;” but in 1645, when the king’s affairs became desperate, and the “Mercurius Aulicus” could be no longer supported, he quitted Oxford, and wandered from place to place, himself and his family reduced to the utmost straits. At Winchester he stayed for a while with his wife, &c. but that city being at length delivered up to the parliament, he was forced to remove again. In 1648 he went to Minster-Love! in Oxfordshire, the seat of his elder brother, which he farmed for the six or seven years following of his nephew colonel Heylin, and spent much of his time in writing. 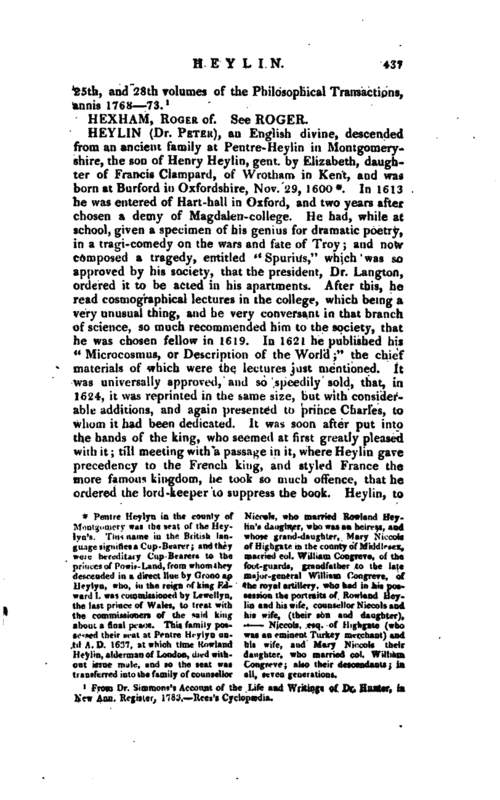 On quitting this farm, he went to Abingdon in Berkshire, where he also employed himself in composing treatises, which he published from time to time. Upon the restoration of Charles II. he was restored to all his spiritualities, and undoubtedly expected from that prince some very eminent dignity in the church, as he had heroically exerted himself in behalf of it, -as well as of the? | crown; and endured so much on that account, during their suffering condition. Here, however, he was utterly disappointed, being never raised above the sub-deanery of Westminster, One day when bishop Cosin came to see him, he said “I wonder, brother Heylin, thou art not a bishop, for we all know thou hast deserved it.” To which he answered, “I do not envy them, but wish they may do more than I have done.” He died May 8, 1662, and was interred before his own stall, within the choir of the abbey, leaving by his wife, Lretitia, daughter of Thomas Highgate, of Hayes in Middlesex, esq. four children. Biog. Brit. Yemen’s and Barnard’s Lives. —Ath. Ox. vol. II. —Gent. Mag. LXXIV. 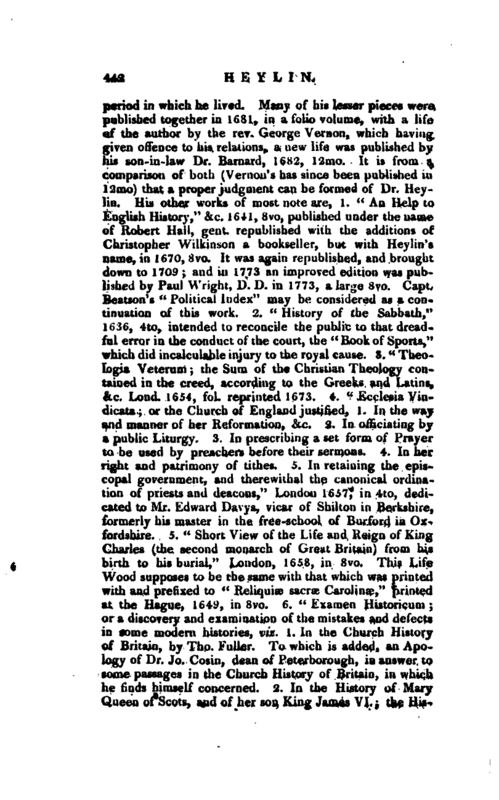 p. 723.